Several months ago I bought a video graphics adapter for USB 2.0 port. It’s compatible with Linux, Mac and Windows but for a while I’ve only used it with Windows where it works as a extended screen for my HDMI main display. It works very good with 1920×1080 pixels resolution and it can play videos fast enough using a standalone video player or HTML5 video streaming from the internet. 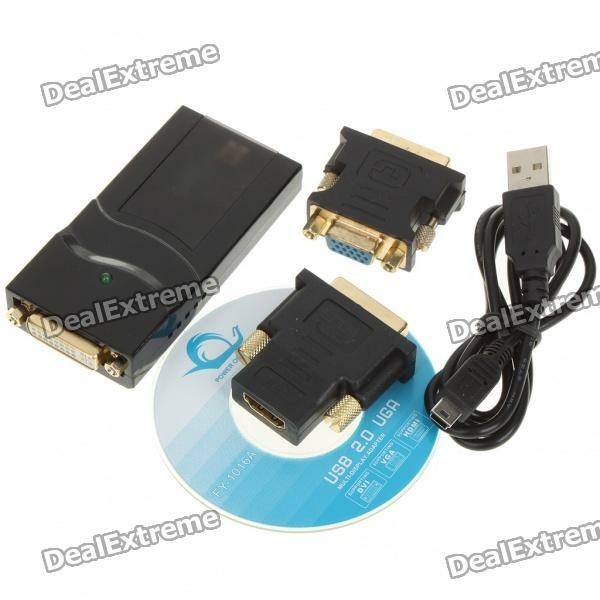 The chipset used by this product is DISPLAYLINK DL-165 with DVI, HDMI and VGA adapters. It is powered by USB port with 5V DC and 450mA about 2,25W of consumption; but after installing the display driver I lost 2GB of RAM, which in my case it isn’t a problem but sometimes it could be a handicap. If you are interested in this product I bought it in DealExtreme webpage, the product page is here and costs 34,28€ with free shipping.